Turkey is a key country in order to realize the Southern Gas Corridor (SGC) due to its geographical location. However, as the main transit country within the SGC, Turkey could potentially exert market power with gas transits. Whether Turkey exerts market power or not, is crucial for an economic assessment of the SGC. Hence, the article investigates this issue quantitatively using a global partial equilibrium gas market model. An oligopolistic and a competitive supply structure in the European upstream market in 2030 are considered in the model based on calibrations to historical gas market situations. If the European gas market in 2030 is characterized by an oligopolistic supply, Turkey is able to exert market power resulting in higher prices compared to competitive transits, in particular in South Eastern Europe. In a competitive market structure, however, the importance of the SGC and thus the potential of Turkish transit market power is limited. Proceedings - Turkish natural gas consumption's role in eu energy diversification: the nabucco project's ill-considered foe, "turkish consumption"
Forum - What Will Happen if Gazprom Stops Transiting Gas Across Ukraine? 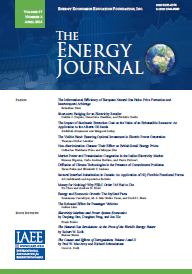 Published in Volume 40, Number 2 of The Quarterly Journal of the IAEE's Energy Economics Education Foundation.